I'm well into the second week of my trip to Peru with Gowildperu. I can straight away say it's been worth every penny. I'm fortunate to be travelling in the best company - Jamie Horne, Steven Grant, Alan James, Ian, Lance Peck and Felix Manami. We have caught so many superb species, easily more than 125 species of fish, most of them being catfishes, but also knife fishes. This has exceeded my expectations. It's not an 'easy' trip - I'm an extreme arachnophobe. I've cut my ankles on razor grass, been bitten by sandflies and mosquitoes and 'no see 'ems', but to be fair I expected this. And at times it's very warm! At times we had to make our way through heavy rainforest, passing army ants, fire ants on certain plants etc, to get to swampy waters - each time it was worth it. We also scrambled over boulders and cobbles in rapids. There was also fantastic insect and bird life, beautiful butterflies everywhere. The base lodge is quite basic and safe, but comfortable enough... with all the facilities you need. The food provided is excellent! A laundry service is available, beds are made and the place is cleaned daily. The transport and the guides are simply the best. Where to catch and information on local conditions is great. The fish caught are transported and housed with superb skill and professionalism. All in all, I've had a great experience with Gowildperu and thoroughly recommend it! There are still a few openings for scheduled GoWildPeru 2017 Collecting Trips. If you are intersted in other dates and can get a group of at least four together then please let us know and we will do everything possible to make your trip a lifetime experience to cherish. November 4 - 18 - Collecting with Ian Fuller (UK) and Michael Barber (US) for fifteen days/fourteen nights. Exploring new collecting locations for potentially undescribed and new species. Plus returning to some of our favorite collecting locations in the Cloud Forest looking for Hillstream Ancistrus species. Just a couple spots remain on this trip. Working on details for the May collecting trip to Florida. Arrivals in Tampa on Sunday, 7 May with visits on Monday and/or Tuesday to a small independent fish farm; a manufacturer of ornamental fish shipping bags; and an industry leader for wholesale ornamental fish, supplying pet stores, public aquariums, and research institutions. Monday evening we will attend the Tampa Bay Aquarium Society meeting. After several days collecting and visiting aquarium related destinations in the Tampa area we will travel down the west coast of Florida stopping at a few locations en route to the Miami area. While in the Miami area we will visit one of the nation's leading producers of aquarium plants. We will have notable local guides accompany us during this trip. GWP will provide hotel rooms and transportation - cost is tentatively set to come in around $1,000 per person double occupancy, single occupancy will be about $500 more. Meals are not included; however, the hotels do provide breakfast. Details and costs are all subject to change as we further refine the plans. Travel to Tampa and return home from Miami is not included. Fish Collecting Expedition: Amazon AND Southern Peru Combo! Description: A unique northern-Peru/southern-Peru fish collecting opportunity thanks to a collaboration between GoWildPeru (based in far southern Peru) and MT Amazon Expeditions (based in the northern Peruvian lowland Amazon). Boat-based Amazon fish collecting trip out of Iquitos, Peru, with option of adding night-time Discus collecting on 18 & 19 August 2017 (additional cost and earlier arrival). Travel from Iquitos to Puerto Maldonado (Madre de Dios State in far southern Peru) on 26 August until 2 September 2017 for lodge-based cloud forest collecting. There is very little overlap in the fish fauna of the two sites, and while more species will be encountered in the Iquitos region, the Puerto Maldonado region has numerous cooler water specialties rarely seen in the aquarium hobby. Cost: $2,995 (includes Peru domestic airfares Iquitos-Lima, Lima-Puerto Maldonado). A deposit of $500 is required at time of booking so that airfares from Iquitos to Puerto Maldonado can be purchased. Travel insurance in case of cancellation is included. Itinerary: Depart Iquitos aboard the M/V Esperanza at 10 AM on Sunday 20 August 2017. Participants should arrive on an early flight on Sunday, or on Saturday 19 August (hotel included). Return to Iquitos around noon on Friday 25 August 2017, transfer of fish to exporter facilities and opportunity to purchase additional fish. On Saturday, 26 August, travel from Iquitos to Puerto Maldonado (via Lima). Collect in the Puerto Maldonado area from Sunday 27 August to Friday 1 September 2017. On Saturday 2 September, fly from Puerto Maldonado to Lima and onward destinations. Optional Extension: Add an additional week with GoWildPeru in southern Peru from 3-9 September 2017. Cost: $1000. Will include two nights at a local rainforest lodge. Discus collecting: Arrive in Iquitos by early afternoon on Friday 18 August 2017 for travel to a local fishing village on the black-water Nanay River. Accommodations aboard the M/V Esperanza riverboat. Each participant will be paired with a local fisherman for two nights of discus collecting using dug-out canoes. On Saturday 19 August, there is also the option of local day-time fish collecting. Cost to be advertised. The CDC--Centre for Disease Control and Prevention, USA—issued a Zika travel warning for all of South American. One question asked us is about the risk of contracting the Zika virus in the areas GoWildPeru visits and collects in. We made intensive enquires and found no evidence of any cases occurring in the Cusco or Madre de Dios regions. Peru has just one reported case of Zika. This was a Venezuelan man who contracted the virus while traveling outside of Peru. I would suggest those concerned look at the CDC website for guidance on preventive measures. We had a cancelation due to medical conditions on the November 2017 collecting trip. Regretably, I can't take the open slot due to Thanksgiving in the United States. This means there is an open slot on the trip for anyone interested in joining Ian for two plus weeks of very interesting collecting in the Madre de Dios with a trip into the Andean foothills to explore new areas. Please send an email to Michael@GoWIldPeru.com if interested in special pricing for this last slot on this trip. Many really nice pictures of his trip are available for viewing. He booked the five day/four night trip in three star hotels listed on the GoWildPeru website. GoWildPeru is thrilled to post the 2017 Calendar. 11 - 18 March - 8 day / 7 night package. Second Annual one week trip with focus on collecting Annual Killifish: Moema and Aphiolebias. We may also fit in collecting other target species if there is interest and collecting conditions permit. Cost $1,495. 8 - 22 April - 15 day / 14 night package. Collecting Moemi quiii with Ian Fuller. Cost $2,495. July - open dates. Will select dates dependent on interest for a 11 day / 10 night package of collecting. Cost $1,995. Please contact Michael@GoWildPeru.com if interested. August & September - Rain Forest to Cloud Forest collaboration with MT Amazon Expeditions. Basic Package: 20-26 August boat based Rain Forest collecting trip out of Iquitos, Peru with option to add night Discus collecting on 18 & 19 August for an additional cost. 26 August - travel to Puerto Maldonado, Peru. 26 August - 2 September lodge based Cloud Forest collecting trip out of Puerto Maldonado. Peru. Cost $2,995 includes domestic airfare from Iquitos to Puerto Maldonado. Gold package: add an additional week with either MT Amazon Expeditions 13 - 19 August or GoWildPeru 3-9 September. Platinum package: two weeks with MT Amazon Expeditions 13 - 26 August and two weeks with GoWildPeru 26 August - 9 September. If interest in premium package please email Michael@GoWildPeru.com. 4 - 18 November - end of dry season collecting trip. Cost $2,495. GoWildPeru encourages Aquarium Society groups and others to charter open dates on the calendar. The advantage is that GWP can arrange shipping of fish collected to the nearest USF&WS port of entry for the entire group as opposed to trans-shipping through an east coast airport. A minimum of four participants is required for a charter. Really excited to travel to San Francisco and Sacramento California this weekend to speak. Looking forward to sharing GoWildPeru with new friends. Will share some pictures when I return. 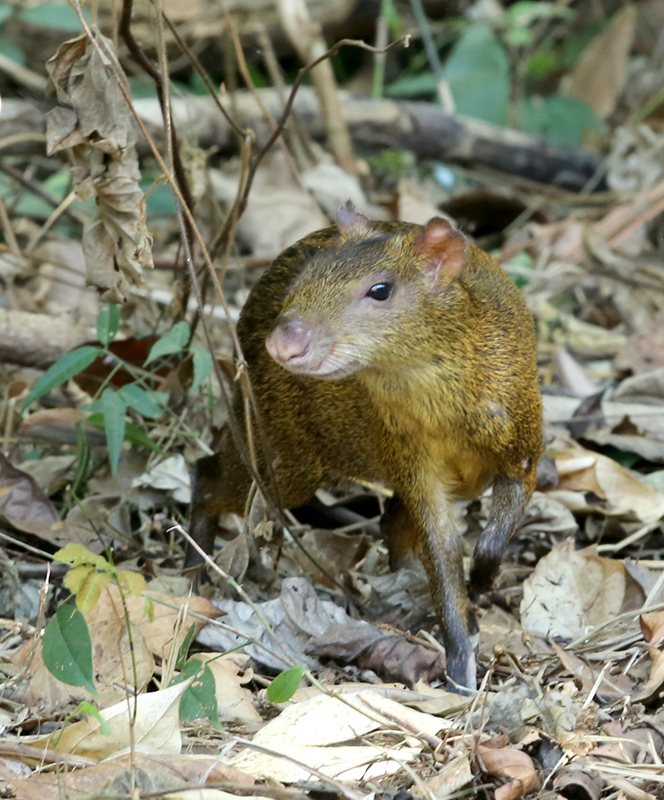 This little Agouti was an early morning visitor outside of our aquarium facility. 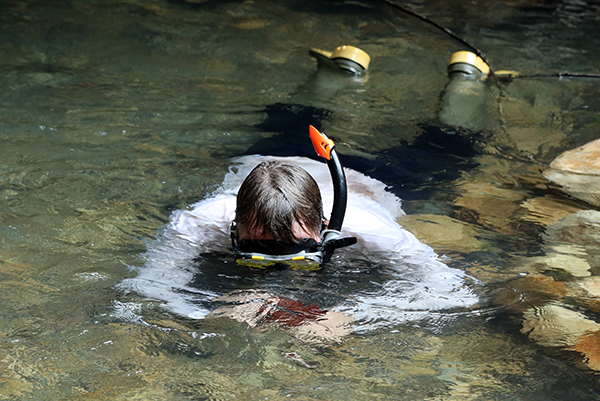 Snorkelling in a clear mountain stream pool. 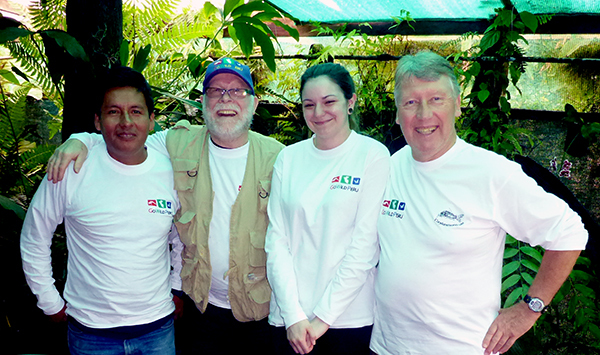 While on our recent fish collecting trip to the Madre de Dios, we called into Bellafern in El Triunfo to visit our friends Lance and Belinda Peck at there orchid and pepper farm.